The Wife and I were out shopping last weekend and we came across a toy sale. One of the things on sale was this puzzle. I don’t know how long they had had them in stock before the sale, but they had at least three full pallets of these things. Apparently they weren’t selling very well. We decided to buy one as a (gag) gift for a friend who’s family does a lot of puzzles, so we picked one up. Imagine our surprise when, at the register, it rang up for 50% off of the sale price. 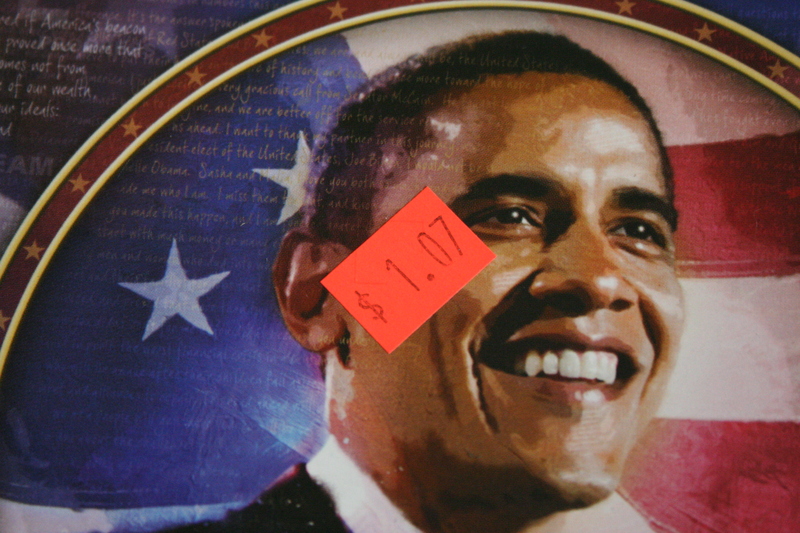 Yes, we purchased this amazing representation of President Obama’s legacy for the staggering sum of 54 cents. I guess the Administration has been right about the economy all long. No inflation here folks. Apparently the Hope and Change luster has lost some of its sheen. ps. I had to wait to post this until my friend had received his “gift” so as to not spoil the surprise. 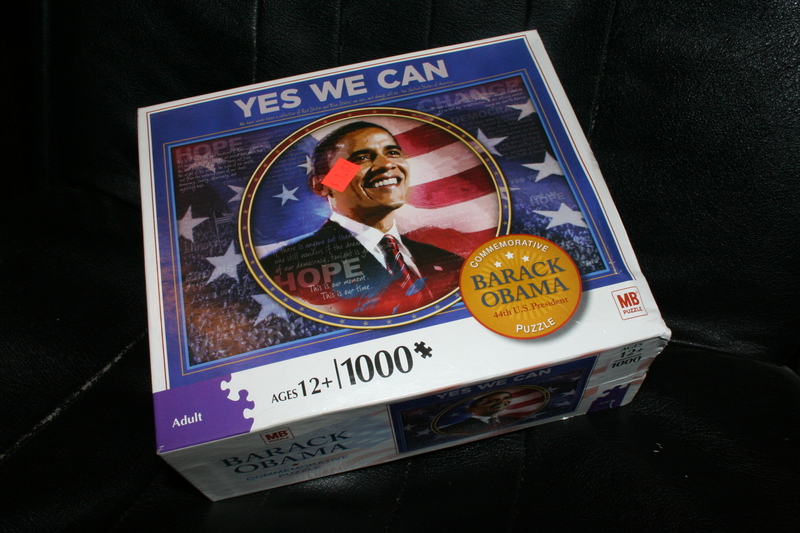 Thank you so much for the Milton Bradley Commemorative Barack Obama “Yes We Can!” puzzle. I’m at a loss for how to show my most heartfelt appreciation. Email won’t come close. A proper response requires pen and ink on paper. Honestly though, I fear that alone will surely fall short as well. I’ll put serious thought toward how one might properly reciprocate such a thoughtful and beautiful gift from as dear a friend as yourself. It will most likely take a few days of pondering, but fear not. A solution will come. On a more mundane note, the transaction you completed prior to making me this wonderful gift is a testament to the efficiency by which the market clears precious commemorative items such as these. $1.07. Priceless. Curt, that is truly priceless. Nyuk! I saw some ObozO Calendars back in January marked down from $12 to a buck. I thought about buying a few for posterity's sake. Then I thought, "Naw…probably be worth about as much as those Billy Beer cans I've been holding on to since college." Awesome! I always get a chuckle out of the bargain-priced Obama books in the local B&N. Although, from the tone of your friend's response, I'd be afraid…very afraid. That sounds like the beginning of a great practical joke comeback. A cheap bargain for a harmless gag. You got more than your money's worth on the deal. Don't miss out on other commemorates like the Chia-Obama and the Obama coin. Three pallets? Looks like someone didn't predict the supply\demand analysis very well. Depreciation is a real b!#@h. Just imagine how much you would have had to spend 30 years ago for that puzzle!